“On The Ropes” Boxing Radio returns this week with host Jenna J to discuss all the recent fights and fight news in boxing. In this episode, I will recap the mega event between Floyd Mayweather and Conor McGregor which saw Floyd Mayweather get the 50th win of his career by stopping the MMA star. I will talk about the impact of the fight on the sport as well as the aftermath of the event. I will also preview the upcoming rematch between Roman Gonzalez and Srisaket Sor Rungvisai and give my prediction on the fight. The first guest on this edition of ‘On The Ropes’ is former light heavyweight contender and current trainer, ‘Iceman’ John Scully. I ask Scully about his decision to boycott the Mayweather-McGregor event and what the fight will do for boxing. Additionally, John Scully looks ahead to the highly anticipated middleweight showdown between Canelo Alvarez and Gennady Golovkin and offers his prediction for the fight. Lastly, Scully gives an update on Artur Beterbiev and talks about Beterbiev’s future in the light heavyweight division. 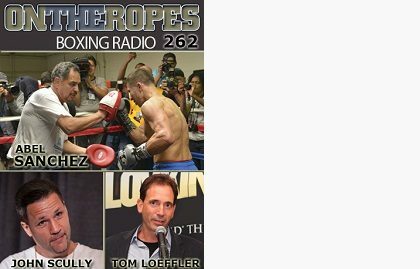 Also joining the show this week is managing director of K2 Promotions, Tom Loeffler, who is in the process of co-promoting one of this years most anticipated boxing events, Golovkin vs. Alvarez. Tom shares his views on the fight finally coming together after a couple of years of unsuccessful negotiations and if he feels this is the right time for the two stars to square off. Loeffler also speaks about the return of Roman Gonzalez following the first defeat of his career and how he prepares to fight Srisaket Sor Rungvisai for a second time. Lastly, Tom discusses the final preparations for Canelo-Golovkin and how he feels the fight will play out. The main guest on this show is Abel Sanchez, the head trainer of IBO/WBC/WBA middleweight champion, Gennady ‘GGG’ Golovkin. Sanchez is entering the final stretch of training camp as his star fighter gets ready to defend his titles against Mexican star, Saul Alvarez. Abel gives an insight into the training of Golovkin, including the sparring partners being used to prepare for Canelo. I also get his views on the timing of the fight and if he has any worries about getting a fair decision from the judges, should the fight go the distance. Lastly, Abel discusses the Maweather-McGregor event and gives an update on his current stable of fighters. 2 Responses to "Abel Sanchez on Golovkin vs. Canelo & Mayweather facing the winner. Tom Loeffler on the GGG vs. Canelo promotion. John Scully on Mayweather-McGregor & more. OTR #262"
Abel is right about FLoyd’S WIN. Put a * on his 50th win.